What was Cincinnati's place in the nation at the time of the Harvard Club's inception in 1869? Christopher Phillips, the John and Dorothy Hermanies Professor of American History and the University Distinguished Professor in the Arts, Humanities, and Social Sciences at the University of Cincinnati, joins us with insights into the post-Civil War era in the city and the entire Middle Border region astride the Ohio Valley, Abraham Lincoln’s home region. Phillips explains how, far from being a fixed and static boundary between the North and South, these border states experienced fierce postwar conflicts over political and social loyalties that made the Ohio River into a border by way of distinctive cultural and regional identities among their white and black residents. Dr. Phillips is the author of seven books focused on slavery and freedom, urban African Americans, emancipation, war, race, politics, and memory during and after the Civil War era, including The Rivers Ran Backward: The Civil War and the Remaking of the American Middle Border (2016), which received Tom Watson Brown Prize from the Society of Civil War Historians and the George and Ann Richards Center for Research on the Civil War Era, as well as the the Society of Military Historians' Distinguished Book Award, the Midwestern History Association's John Gjerde Prize, the State Historical Society of Missouri's Missouri Book Award, and the Ohio Academy of History's Distinguished Book Prize. It was also named a Choice outstanding academic book and a Civil War Monitor best book of the year. Other books by Dr. Phillips: The Civil War in the Border South (2013); Freedom's Port: The African American Community of Baltimore, 1790-1860 (1997), a cowinner of the Best Book prize from the Maryland Historical Society; Missouri's Confederate: Claiborne Fox Jackson and the Creation of Southern Identity in the Border West (2000); and Damned Yankee: The Life of Nathaniel Lyon (1996), a Choice outstanding academic book. His essays have appeared in such publications as Journal of the Civil War Era, Civil War History, and the New York Times. His work has been supported by the National Endowment for the Humanities, the American Philosophical Society, the Andrew W. Mellon Foundation. From 1999 to 2011, he served as a coeditor of Ohio Valley History. CLICK for DIRECTIONS: The Taft Center at Fountain Square is located on the 2nd floor of the U.S. Bank Building on the corner of 5th and Walnut Street across from the Fountain Square parking garage. The garage is open to the public. The link lists other parking options, as well. 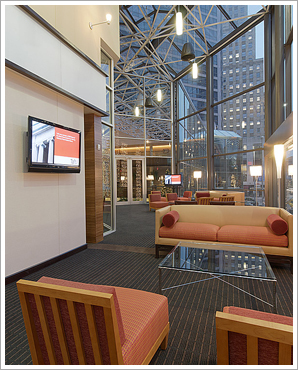 Taft Center is a state-of-the-art meeting space with a front row seat to one of the most exciting views in the city – Fountain Square. From the square, the city is able to see through the windowed walls of The Taft Center to its illuminated 1,200-square-foot “living room,” equipped with wireless network and movable seating. Beyond are private meeting rooms of varying sizes, fitted with high-tech electronics for international conferencing. The largest meeting room can accommodate up to 120 people in theater-style seating and 80 for sit-down dinners. Nearby is a large catering kitchen.